James Welling, La Brea Avenue south of the 10 Freeway, Los Angeles, February-March 2010. Part of "How Many Billboards? Art in Stead" temporary project organized by the MAK Center for Art and Architecture. 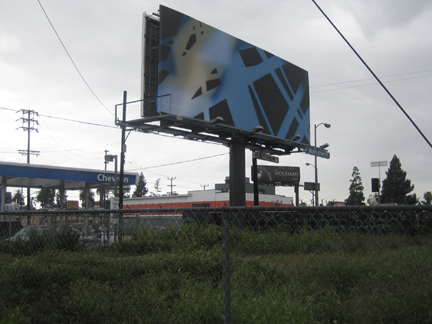 "Welling's... billboard image reveals rectangular shapes of deep blue with touches of brown slashing through a black background. Viewers are not meant to identify "what" the image is but rather to mentally slow down and think, prompting a self-conscious process of looking. " - text from a longer description by Lisa Henry, http://www.howmanybillboards.org/, accessed 03/2010.